Greece and we’re talking Ancient Greece where the world’s greatest, most amazing, unsurpassed dessert was first created. What is it you say with despair? It’s Cheesecake of course. The story starts on the isle of Samos about the seventh or eighth centuries B.C.E. It was there that the great inventors of dessert…OK I don’t really know if they are the inventors, but I get excited when it comes to dessert. So on the isle of Samos is were they began pounding cheese into a thick paste, using honey as a sweetener and setting it into a crust of wheat. The age old question is though, is it truly a cake? Will let me tell you about the first time I made a cheesecake. The recipe called for three tablespoons of flour. I thought only three tablespoons? And why not, most cakes call for 1 1/2 cups or more of flour. But the three tablespoons were added. When I make my second cheesecake, I opted to leave out the flour to see what happens. To my surprise, nothing. It bake up just fine like the first one. So off to Google to see why only a small amount of flour is added. I learned the never ending battle, that is if cheesecake is truly a cake. Flour was not in the original cake and if you have no flour, it cannot be called a cake. So if it is not a cake than what is it? Some say a Tort. Which many torts are just made with cheese. Then there is custard, much like your French Crème Burlee or your Spanish Flan. The two which are made just like a cheesecake. How so? The principle ingredients being: milk and eggs. Of course sugar is added for sweetness. They also use a water bath, necessary to bake them. I have decided I’m not going to get involved in the dispute. Many things including food have a name that has nothing to do with what they are or look like. 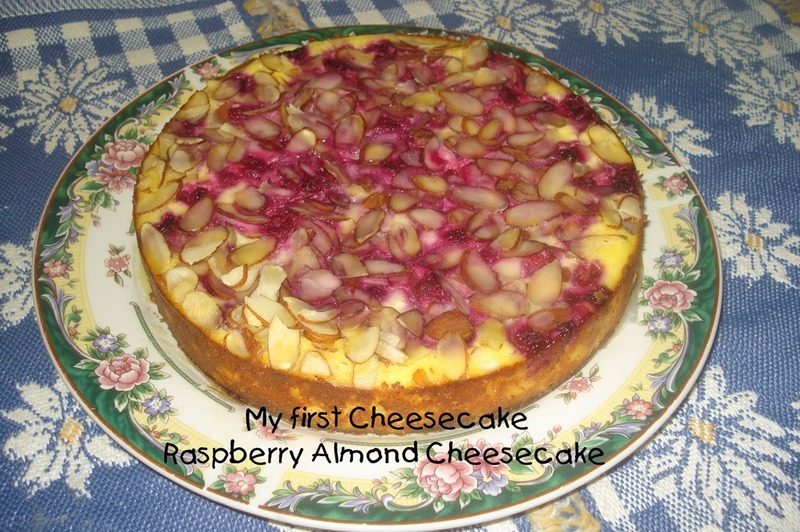 Here is a modern day improved upon cheesecake, since the Greek’s first made one. 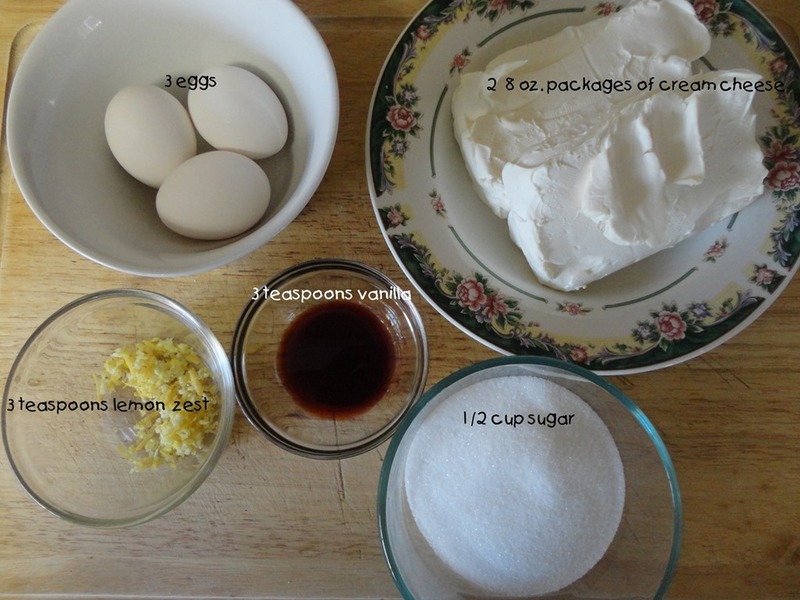 Here is what you will need for the crust and the filling. Also you will need 1/3 cup of flax seed. Place the seed in a food processor and pules on crush until you have a fine flour texture. 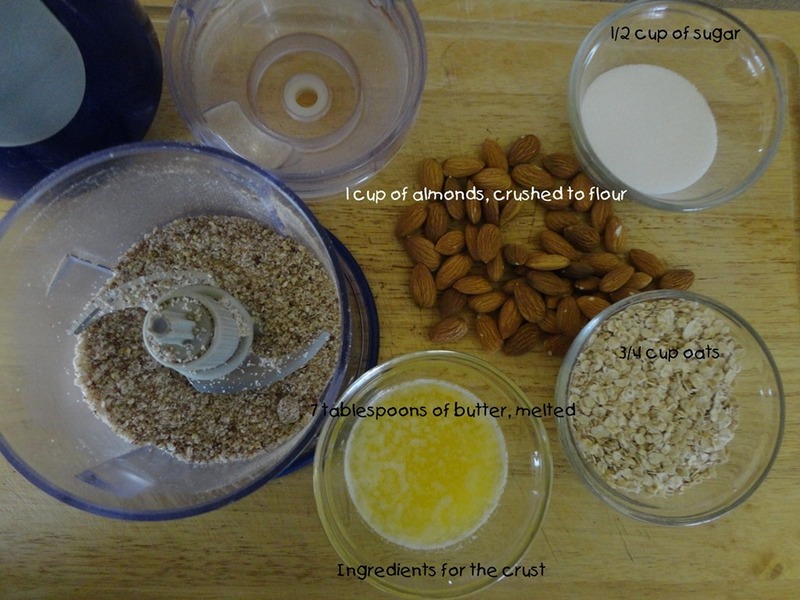 Next add the almonds and process more and than add the oats. Make sure the grains and almonds are a flour texture. Once you have done this, in a medium bowl, spoon in 1 1/3 cup of the almond flour and add the melted butter and incorporate well. Line four 4 1/2 inch spring form pans with parchment paper. 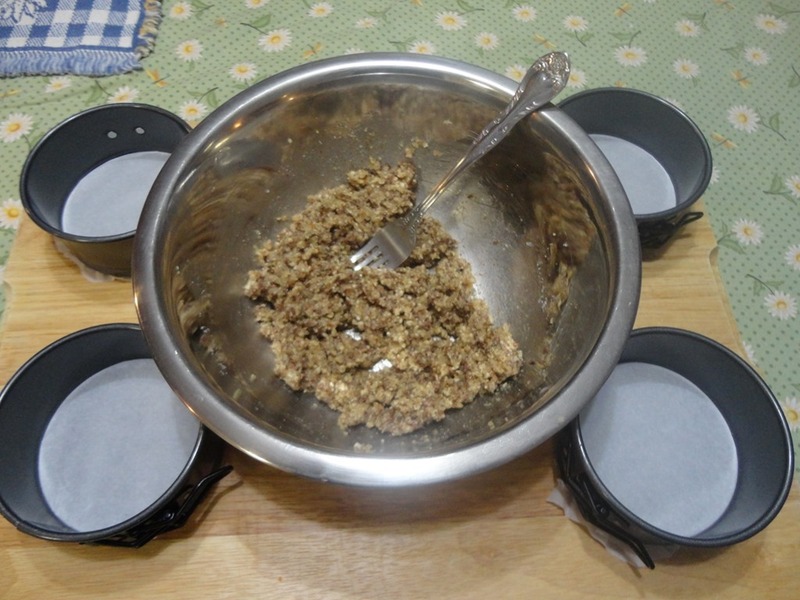 Next place 1/4 cup of almond paste mix into each spring form pan and press out paste to reach the sides of the pan. You will also need 1 cup of plain Greek yogurt. Here is how you incorporate the ingredients by step. Make sure your eggs and cream cheese are room temperature. 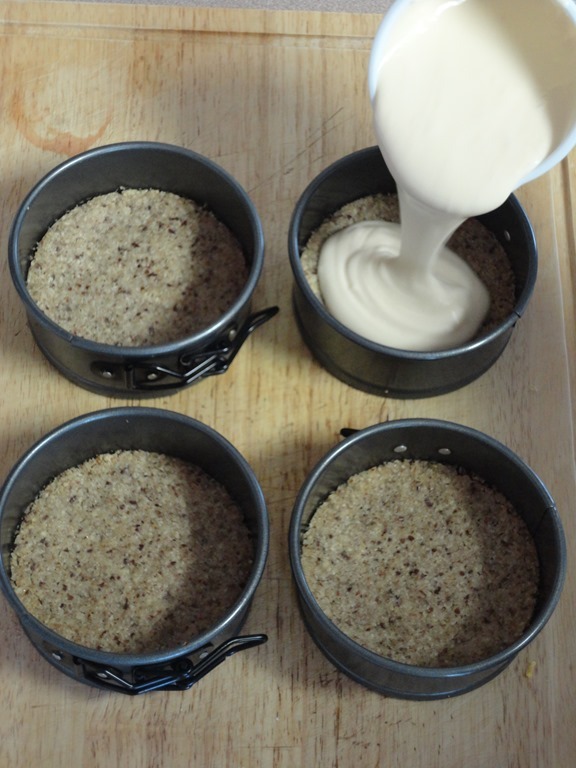 Be careful not to over process the ingredients so no air is left in the cheesecake, with too much air incorporated into the filling, cracks are likely to develop while the cake is baking. Note: after step four refer to recipe at the end of this post under STIR-IN IDEAS if you wish to stir in other ingredients. Now pour 1 cup of filling into each spring form pan. Now we need to make a cheesecake water bath. A cheesecake bath is a fail-safe way to stop your dessert from cracking, it also keeps the oven moisture very high and allows the heat to be gentle on the cake, allowing it to cook more slowly and evenly. The water evaporates before it gets as hot as the oven, cooling the edges of the cake so it bakes at the same rate as the center. Using a roasting pan fill it half way with hot water and place it on the bottom rack of you’re your heated oven. Place spring form pans filled with cheesecake on top rack just over the bath water. Bake for 45 minutes or 60 minutes if you are baking a 7 inch or larger cheesecake. But today we are using our Nuwave oven. The hot water is poured into the pan. The racked is place over the water and the cheesecakes are placed onto the rack. In the Nu-Wave oven we only have to bake the cheesecake for 20 minutes. Half the time and thank thinking minds for modern inventions. When the cakes are done allow 15 minuets to cool. Than place in the refrigerator for no less than 3 hours. Then with a knife loosen edges and remove from spring form pans. Top cheesecake with fruit or eat plain. Here blueberry jam was used to to finish the cake. You can also make it a Almond Brickle-butter Cheesecake. Before baking add 1 cup crushed heath bars to mix. After cooling add some fresh whipped cream to top and sprinkle with crushed heath bar. At first it can be a choir to make cheesecake. But with practice it will become second nature. Things to remember: cheesecake relies on the proteins in the eggs to give it structure. The proteins coagulate as the temperature approaches 170 degrees. If it over bakes, the cheesecake becomes dry. Never bake cheesecake over 350 degrees. It is recommended using light colored pans to cook and bake with. Cheesecake is one of the exceptions, a dark pan uniformly absorbs heat. Thanks for reading Splendid Recipes and More. Before you go I would like to recommend a website for your viewing, the name of the site is: Is it Really a Cake? . You won’t waist your time going there. In a small bowl mix crumbs, sugar and butter; press 1/4 cup crumb mixture onto bottom of each of 4 mini (4 ½ inch) spring form pans. Bake for 7 minutes. With a food processor; cream the sugar and cream cheese. Add eggs, 1 at a time, mixing after each addition just until blended. Next add vanilla, lemon zest and yogurt and mix again. Pour 1 cup of the batter into each spring form pans. Bake 40 to 45 minutes or until centers are just set. Run knife around rims of pans to loosen cakes; cool before removing rims of pans. Refrigerate 4 hours or overnight. 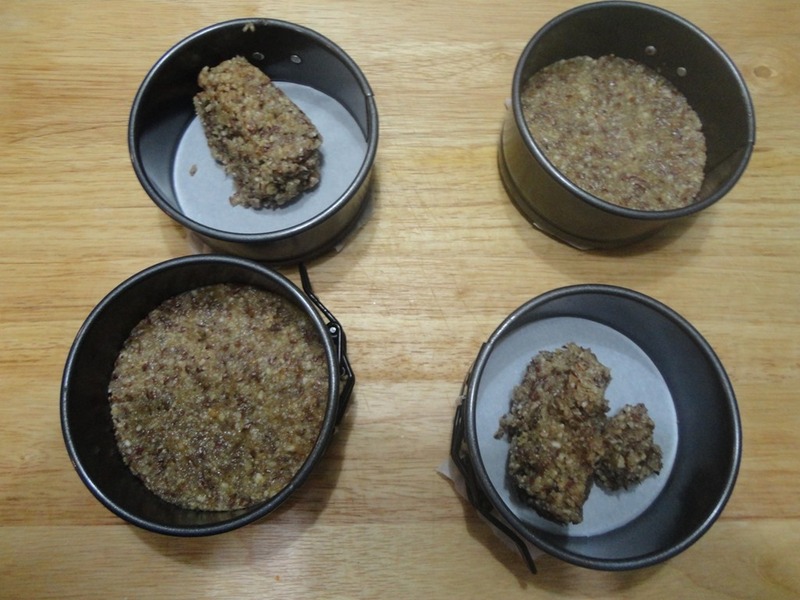 STIR-IN IDEAS: Divide batter amongst 4 small bowls first; than mix 1 cup portion your chose of the following into each bowl. 1. Apple Pie Cheesecake; Stir in 1/8 tsp. ground cinnamon; pour over crust. Bake as directed. Top cheesecake with combined ½ cup warmed apple pie filling and ½ tsp. brown sugar. 2. S’Mores Cheesecake: Stir in 3 Tbsp. chopped Milk Chocolate; pour over crust. Top with ¼ cup Mini Marshmallows and 1 Tbsp. broken Graham Crackers. 3. Chocolate Chunk Mini Cheesecake: Stir in ¼ cup Milk Chocolate chips. 4. 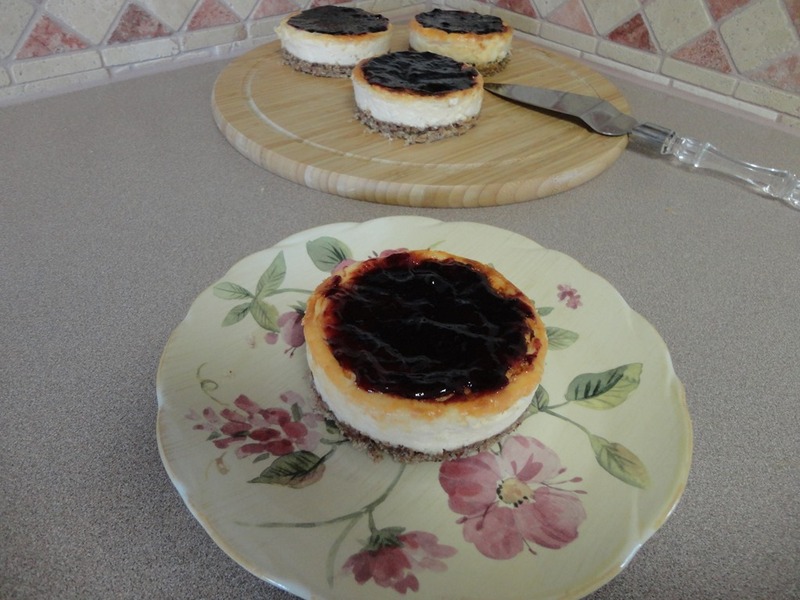 New York Mini Cheesecake: Stir in ¼ cup Sour Cream and 1 Tbsp. flour. 5. Cookies and Cream Cheesecake: Stir in ¼ cup chopped Sandwich. 6. Chocolate Royale Mini Cheesecake: Stir in 2 oz. Semi-Sweet Baking Chocolate, melted. 7. Peanut Butter Mini Cheesecake: Stir in 2 Tbsp. peanut butter and 1 Tbsp. milk. 8. Mocha Mini Cheesecake: Mix 1 tsp. Instant Coffee granules with 2 tsp. hot water. Stir into batter along with 2 oz. Semi-Sweet Baking Chocolate, melted. 9. Fruit Mini Cheesecake: Bake basic mini cheesecake as directed. Just before serving, top with 1/3 cup favorite pie filling or fruit Jam. 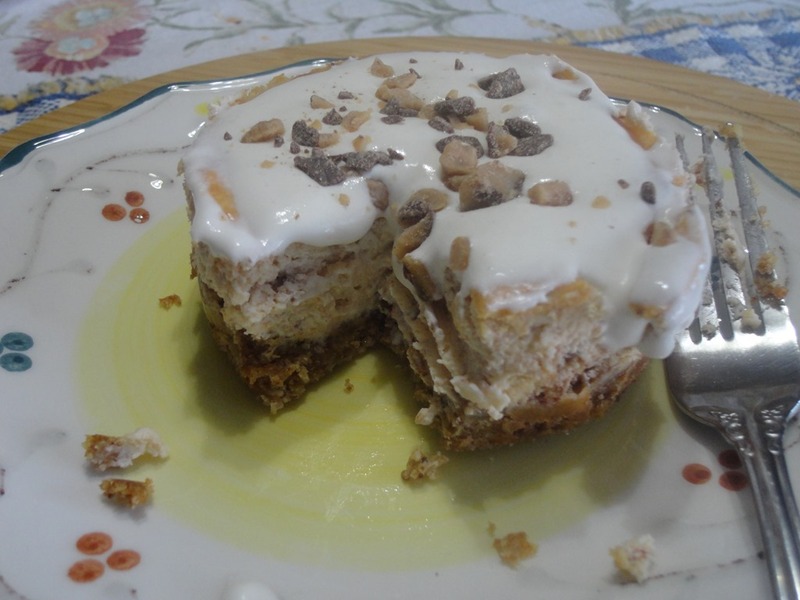 This entry was posted in Cuisines of the World, Dessert and tagged Almond, Ancient Greece, Cake, Cheesecake, Cook, Cream, dessert, Flour, Google, Samos, Strained yogurt. Bookmark the permalink. The mini versions are a great idea. Can freeze some and not be tempted to eat it all week. Yes, you can freeze them. But if you are going to top them with fruit, I recommend freezing the cake..then thaw later and top with your favorite topping. Thanks Jovian for your visit and comments.